Have you ever wanted to transform the look of your existing kitchen? Maybe you want to place your home on the Market for Sale, or simply after a more modern look, maybe that extra bench space you’ve always dreamed of.Kitchen renovations are becoming more and more popular and can bring even the tiredest of kitchens back to life. Trim Joinery can replace the doors, drawers, panels and bench tops from our wide arrange of materials and colour selections. We are so happy with our new cabinetry... it looks gorgeous. And lovely people to do business with... very easy and non-complicated! Thanks Nathan, Kellie and team. Thank you so much for our lovely new kitchen Trim Joinery we are really happy with it and nothing was a hassle, it was all done quickly and professionally. Thanks Trim Joinery for our new kitchen! It looks amazing and exactly what we wanted. Such prompt and efficient service with lovely people to work with. Highly recommended. 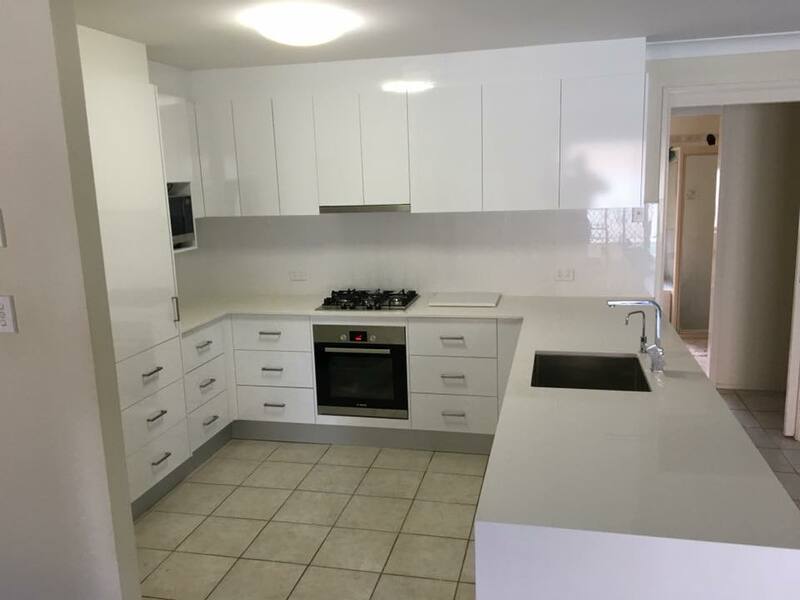 Trim Joinery was by far, a pleasant-hassle free Kitchen Renovation experience!! All-inclusive quote (carpenter, electrician, plumber) gave the us the satisfaction of knowing there would be NO hidden costs. Great communication, delivered & installed on time. Very lovely company to deal with. So happy with the result. Love our new kitchen!! Highly recommend Nathan and team. Wow our kitchen looks fantastic thank you Nathan you made this decision painless we could not ask for a better job i will recommend your skills to everyone you came you designed and you made this is fantastic. We are extremely happy with the work done. the cupboard looks great. I will recommend you any chance I get. Our kitchen (above) is fantastic and is exactly what we requested. Dealing with Nathan was very easy and he accommodated our every request. Quality of workmanship is of a very high standard and we can highly recommend the services of Trim Joinery. After numerous quotes from other companies, Trim Joinery actually listened to what I needed and worked to help find something that would fit my budget. They had great ideas on how to add to my existing kitchen cupboards and you wouldn’t even know it was an add on. Thanks so much - I highly recommend them. After looking for ages for a company to suit my kitchen makeover I found trim joinery. Nathan and Kellie are efficient, a dream to deal with and not only did they help with my kitchen makeover but we completed the cabinetry in our study, fitted out our built in wardrobes and created a floating entertainment unit. All the joinery and work is immaculate - they coordinated the trades for the whole project, have a great network of affordable tradies and take so much pride and care in their work and your house - oh and they are tidy too!! Can't recommend them enough!! We love our reception counter/desk at Daleys Point Swim School. Thank you so much!! Trim Joinery are amazing they recently completed our Laundry and Kitchen Renovations. We were extremely happy with the standard of work and customer service was fantastic we highly recommend them! Copyright © 2018 Trim Joinery. All Right Reserved. Designed by JR Technologies.